A new Galaxy S10 photo suggests that Samsung's flagship smartphone will sport a fresh all-screen design with a pinhole camera, according to a new leak today. Samsung Galaxy S10 rumors have previously hinted at less bezel around the display by moving to a 'punch hole' cut-out in the screen to fit the front-facing camera. But this is the first alleged live Galaxy S10 photo – not just a render – we've seen, and it comes from smartphone leaker Evan Blass. He drops the codename as 'Beyond 1'. 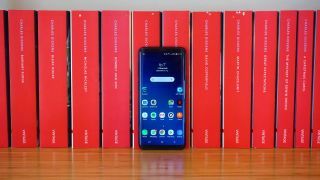 We could see further hints of the Galaxy S10 at CES 2019 next week (Samsung did tease the Galaxy S8 at CES 2017), but expect it to officially launch closer to MWC 2019 at the end of February. Wireless charging of other devices? "One cool feature I haven't heard mentioned previously is this model's ability to wirelessly charge other compatible devices like handsets and watches," he says. The Huawei Mate 20 Pro that launched in October of last year is able to wireless charge other devices that support Qi charging. Samsung may be taking this 'reverse wireless charging' idea mainstream, which would be a first in some markets like the US where Huawei phones aren't sold.